Today’s recipe is spicy beef and vegetable soup, called dakgaejang. 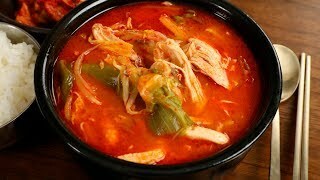 It’s a delicious hot and spicy soup, and with just one small chicken you can feed a lot of people. That’s good value! And if you’re making it for yourself just freeze the leftovers and eat them for a while. 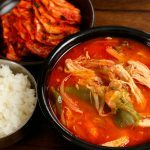 If you made my yukgaejang recipe before you’ll be familiar with this cooking style, but in this recipe we use chicken instead of beef. This soup is very savory, and using a whole chicken makes the broth very tasty. Plus the smoky hot pepper flakes mixture, all the added vegetables, and especially the green onion and gosari, make for a delicious, nutritious, well-balanced soup. You just need to serve with a bowl of rice and kimchi and it’s a perfect meal. I used dried red chili peppers with the seeds, but you can replace them with about 1/2 cup of small dried red peppers. Korean moms going away for a few days – especially to visit their own moms – will make this for their families so they have something to eat while she is gone. The soup will last for a few days in the fridge, and with premade rice mom can leave home without too much guilt because that soup is so nutritious. 8 ounces soaked gosari (fernbrake) see how to soak gosari here. Dried fernbrake usually expands to 10 to 11 times in size when it’s soaked. For this recipe, you’ll need a little less than 1 ounce (about 0.8 ounce) dried fernbrake. Remove any giblets from the chicken. Rub ¼ cup of salt all over the chicken and giblets, then rinse in cold water until they are very clean. Drain and put them into a large heavy pot. Cut 1 daepa (or 8 green onions) into 4 inch long pieces and add them to the pot along with the ginger. Add 14 cups of water and cover. Cook for 1 hour over medium high heat until the chicken is tender. If it’s still tough, add some more water and cook a little longer until you can pull the chicken apart easily. Transfer the chicken to a large bowl and let it cool down until you can handle it with your hands. Separate the meat from the bones with your hands. Tear the meat into bite sized strips. Add 1 tablespoon fish sauce and 1 teaspoon salt to the meat and mix it well by hand. Set aside. Pour the broth through the paper/cloth filter so all the fat, cooked green onion, and ginger are strained out. You should have about 11 cups of clear and flavorful broth in the bowl under the strainer. Discard all the stuff in the cotton cloth. Wash the pot nicely and put the chicken broth back in it. Heat the vegetable oil in a small pan for about 1 minute over medium heat. Add the onion and fry for about 7 to 8 minutes, stirring occasionally with a wooden spoon until the onion turns a little crispy. Break up the dried red peppers and add them to the pan with the seeds. Gently stir the mixture with a wooden spoon for a few more minutes until the red peppers turn light brown or orange. Remove from the heat and strain the mixture over a bowl. Press it down with the wooden spoon to squeeze out every drop of oil. You will get about 3 tablespoons of orange-colored, smoky, flavorful oil. Add hot pepper flakes, sesame oil, ground black pepper, and 1 tablespoon salt to the hot oil. Mix it well and set aside. Put the mung bean sprouts into a large bowl. Chop the softened gosari 1 or 2 times and add them to the bowl, too. Cut the other 2 daepa in half lengthwise, and then cut them across into 4 inch long pieces. Add them to the bowl. If you use regular green onions, cut them into 4 inch long pieces. Add the seasoning mixture to the vegetable bowl and gently mix everything with your hand until all the vegetables are coated with the seasoning mixture . Bring the chicken broth to a boil. Add the seasoned vegetables and cook for 20 minutes over medium high heat. Add the seasoned chicken and cook another 5 to 10 minutes until it boils vigorously. Remove from the heat and serve right away with rice and kimchi, or a few more side dishes. Put any leftovers in an airtight container and refrigerate them for up to 1 week or freeze for up to 1 month. Posted on Wednesday, March 27th, 2019 at 7:20 pm. Posted April 14th, 2019 at 1:49 pm | Log in to reply. Hi! Thanks for updating with numerous amazing recipes! Could you please do a spicy chicken feet recipe? I’ve seen people eating them with rice balls in reality shows. They look so pretty and mouth-watering! Thank you! Posted April 4th, 2019 at 7:39 pm | Log in to reply. Where are 12 minced cloves go to? I just put them with the seasoning mixture, Isn’t right? Posted April 4th, 2019 at 3:50 am | Log in to reply. It was very useful for me. I’m happy I found this. Thank you for sharing with us,I too always learn something new from here. This recipe was originally posted on March 27, 2019 at 7:20 pm by Maangchi. The video was watched 298,977 times on YouTube & has 12,273 likes!